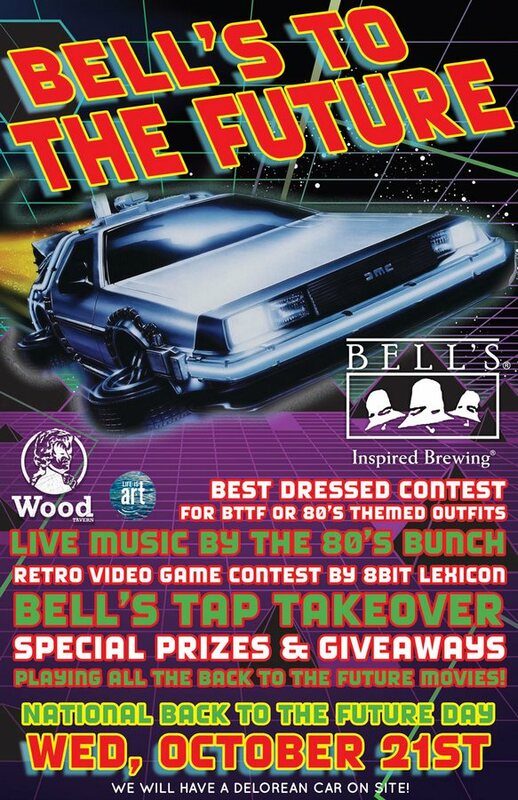 Life Is Art is very excited to have been picked by Bell’s Brewery as beneficiary of their upcoming event, Bell’s to the Future! On National Back To The Future Day (The day in which Marty Mcfly travels to 2015 from 1985) Bell’s Brewery will be hosting the ultimate 80’s party to welcome Marty to the Future! Bell’s Brewery has an exclusive tap takeover. GREAT SCOTT! Beers include: Amber Ale, Oberon, Two Hearted, Lager Beer, Oarsman, Mango Habanero Oberon, Octoberfest, Best Brown Ale, Hell Hath No Fury.. Ale, 30th Anniversary Ale and The Oracle DIPA. Live performance by The 80s Bunch! The greatest 80s cover band in Florida. There will be a retro video game tournament held by 8Bit Lexicon! If thats not enough, there will be a Delorean on site for photos! Come in your best futuristic 80s outfit for the costume contest!